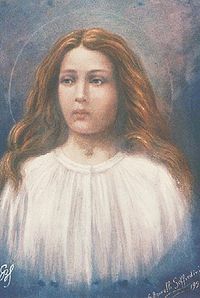 O Saint Maria Goretti who, strengthened by God’s grace, did not hesitate even at the age of eleven to shed your blood and sacrifice life itself to defend your virginal purity. Look graciously on the unhappy human race which has strayed far from the path of eternal salvation. Teach us all, especially the youth, to flee from anything that could offend Jesus and stain our souls with sin. St Maria, pray that we may one day enjoy with you, the eternal glory of Heaven. Amen. Dear Saint Maria Goretti, the world teaches that we must please others in order to be popular. Conscience demands that I please God more than the one who asks an evil act in the name of false love. Teach me by your example to instil in others a real respect for modesty and purity. Through your powerful intercession, help me to make this social event an occasion for helping others to become spiritually stronger. Grant that others may see in me, reasons to change their ways if that be necessary and that I may have the courage to resist any temptation of sinful conduct. Let others be led closer to Jesus and Mary by my example. O Little Saint who wanted to be popular only with your Divine Master and His Blessed Mother, help me to imitate you. Amen. Dear Little Saint Maria Goretti, teach me that God must be my first love and that all other love is based on Him and Him alone. Obtain for me the grace to cease toying with the occasions of sin and to remember that my body and the bodies of all in grace are temples of the Holy Spirit, destined someday for a glorious resurrection. Through your beautiful example, teach me the value and dignity of Christian modesty. Grant that I may never be the occasion of dragging others into Hell, by suggestive words or evil deeds of any kind. Through the merits of your Martyrdom, obtain for me the grace to turn aside from sin, no matter what the cost, so that one day I may enjoy Heaven with you and all the other saints. Amen. Pray: Our Father, Hail Mary, Glory be to the Father. Dear God, we ask you to help all those who suffer abuse. Help them find healing and peace in their life. May Maria Goretti, who was strengthened by Your Grace, join us in prayer for the healing of all victims of abuse, particularly those abused as children or young adults. Lord God, grant us your Love that we might reach out to them in Your Name with hope in times of trial. As Maria prayed for her attacker, grant us the grace to pray for the true conversion of all who abuse, that they will seek Your Mercy through prayer and penance. Loving God, pour into our hearts and lives your healing Spirit so that the sacredness of every human person will be respected and protected as the precious image of God. Help us to live in the peace which Maria Goretti found in Christ and in the love of his mother Mary. We ask this in the name of Jesus Christ our Lord. Amen. Dear God, we ask you to help us find healing and peace in our lives. Grant us hope in these times of trial. May Maria Goretti, who was strengthened by Your Grace, join us in prayer for the healing of all victims of abuse, particularly those abused as children or young adults. Fill us with Your Love so that, as Maria prayed for her attacker, we too might have the courage to pray for the true conversion of our abusers, that they might seek Your Mercy through prayer and penance. Loving God, pour into our hearts and lives Your healing Spirit so that the sacredness of every human person might be respected and protected as the precious image of God.